Howie is a great pattern for those just getting started, because he uses only a few of the most basic skills. You’ll find links to those skills sprinkled throughout the pattern wherever you need them – that way you can learn as you go! Just click on the link to hop to the tutorial. The skills you’ll need for just about any amigurumi are. . .
Additional skills for this pattern. . .
You can go through all those posts now, or just hop to them as you get to those points in the pattern – whatever works best for you! This pattern can be used with any weight yarn! Just use the hook recommended on the ball band, and adjust as needed (see ‘gauge notes’ below). For a bigger, super-cuddly animal, try a bulky weight yarn! Just keep in mind that you’ll use more yardage than recommended. The sample is crocheted in worsted weight yarn, and all yardage/ hook recommendations are calculated based on the sample. Less than 220 yards (1 skein) is required of each color. For the yarn, Stacey used 100% wool worsted weight (Ella Rae Classic the brand used in the sample). However, any worsted weight yarn can be substituted. In case you’re curious about getting the exact gauge Stacey does, it’s 5 rounds=2 inches. Note that you will need to have this gauge for the yardage suggestions to provide an accurate estimation. All stitches in this pattern (that are worked in the round) are worked through the back loop only, unless otherwise directed. Look at this picture. See how one loop is highlighted in black? This is the back loop, and it’s what you’ll stitch into. Stitching into the back loop creates ridges on the right side of the piece. Round 1 sc 6 in 2nd ch from hook (6) This post will help you find that second chain from the hook. Round 2 sc twice in each st (12) This video will help you if you find it tricky to start the second round. Remove hook, but do not fasten off! Flatten feet, and attach to round 7 of body. This post shows to how flatten and attach amigurumi pieces. Flatten wings, and attach to each side of body, at approximately round 22. Attach eye circles to body. The bottom of the eye circles should be attached to round 21, and the top of the eye circles will reach round 27. Be sure that the two eye circles touch in the center. This post shows how to use running stitch to attach flat pieces (like spots) to amigurumi. Attach tummy circle to body. The bottom should be attached at round 9 (two rounds above the feet), and slightly overlap the bottom of the eye circles at the top. Fasten eyes onto the head. To do so, just insert the post where you want the eye to go (for Howie it’s in the center of his eye circles) and press the washer onto the back post to secure. Make sure the washer is pushed on all the way. Stuff beak slightly, and attach over the point where the eye circles and tummy circle meet. This post shows how to do that kind of attachment. Stuff the penguin body and continue crocheting. This post has tips for stuffing amigurumi (it’s a little different from sewn softies), and this video has some terrific help for closing up those last few rounds. Ta da! You made a penguin! Aren’t you proud? You should be! Click here to download a handy dandy printable PDF of the free Howie the penguin amigurumi pattern. I hope you want to make something else now. You can shop for more crochet patterns here. And join the Ami Club here! The Crochet Wildlife Guide Review + FREE Penguin Pattern + Giveaway! I am so excited! I love showing off a great book to you… and there are so many goodies! Keep reading to grab a FREE download of the Chinstrap Penguin by Philip Ha (aka Sir Purl Grey) AND enter to win a digital copy of the book, The Crochet Wildlife Guide. You may have heard me say this before on the blog, but I get a lot of amigurumi books across my desk and for many of them, I say, ‘oh, ok. This has some cute patterns.’ And it ends there. And I’ll admit it, my books are among them. Much of the bare-bones nature of many books you see is completely driven by the publisher’s desire to save money. Cute illustrations? You have to pay an illustrator for those. Step-by-step detailed instructions? Nope. That takes too many pages. Fancy shaping techniques? Oh, no. That doesn’t appeal to a wide-enough audience. For a crocheter who wants extra information either because they’re a beginner (and need the help and explanations) or are adventurous and want to try something new (hence, needing explanations of new and complicated stitches), this formula can be very frustrating. Needless to say, when a book comes to me that breaks the mold, I jump out of my chair with glee! The Crochet Wildlife Guide is a self-published book by Philip Ha and Jeff Wiehler, and the book is filled with creative crochet ideas and an artist’s touch. I was impressed by the coverage of basic crochet techniques as well as detailed instructions and illustrations for each animal. I was also enchanted by the darling illustrations in the book (including this table of contents). The patterns included in the book walk the line perfectly between wildlife-realism and kawaii cuteness. Amigurumi like the red panda on the cover, have little details so the animal is instantly identifiable and unique, but not fussy and still cute with wide appeal. The book also includes a table of the skills required for each pattern. This is such a great idea… you can identify the project that’s just right for you! Throughout the book, the authors emphasize places where you can become your own designer, by highlighting small changes you can make or pointing out the design techniques used to create a particular shape. The photography, with animals photographed in nature, is lovely as well. The book is available for purchase in digital or print form, from The Crochet Wildlife Guide website or from Amazon. Phillip and Jeffrey have given us a pattern that didn’t make the book for FREE so that you can get started on some crochet cuteness right away! Thank you so much, Mirena, for coming by and sharing this new technique with us! One of my favorite FreshStitches patterns is Bentley the Bear, which is crocheted using standing legs. In the standard technique, you get little hole that remains between the legs and you have to sew it afterwards… ah, sewing! So, here is a technique that eliminates the hole and lets you continue your crocheting without worrying about it! Step 1: You crochet the first leg exactly as stated in the pattern BUT at the end you cut the yarn, leaving a long tail and you DO NOT fasten off. Step 2: You crochet the second leg as stated in the pattern (leaving the yarn attached, as instructed). Step 3: You take both legs and you place the first one behind the second one, matching their stitches. Step 4: You place the loop of the first leg on your hook and using its tail you single crochet in the next stitches through both thicknesses. You do 4 sc in total and you fasten off. Step 5: You place the loop of the second leg on your hook and you are ready to continue crocheting! The disadvantage to this technique is the stitch count. Normally, you would have 36 stitches after joining the legs but because we crocheted some of them them to attach the 2 legs together, we lost a few stitches. I solve this problem by increasing in the next round. This technique will work with any pattern with standing legs, you just have to pay attention to the stitch count and adjust accordingly! What a fabulous technique! Thanks so much for sharing, Mirena! This trick will work perfectly with the October Ami Club pattern… want a sneak peek? I can’t believe it’s already September! Time is moving so fast (and um, it was 105 in Los Angeles last week… that feels like July to me!). As always, I have lots of exciting news to share! This month’s exclusive Ami Club pattern is Mojo the Monster! He uses the new shaping technique we learned for the horns last month (single crocheting in one row below instead of using slip stitches, which have a tendency to bias)… I’m really loving it! Mojo uses a 24mm black eye… but I also think he’d look amazing by leaving out the white crocheted eye and just using a 40mm eye (by painting a 40mm clear eye. Check out instructions here.) So many possibilities! These patterns are 50% off for Ami Club members… the coupon code is in the forum. I went with a theme this month… all of the patterns use 18mm brown eyes! That way, you can buy a 5-pair pack and make all 3… and still have two pairs! Hooray! 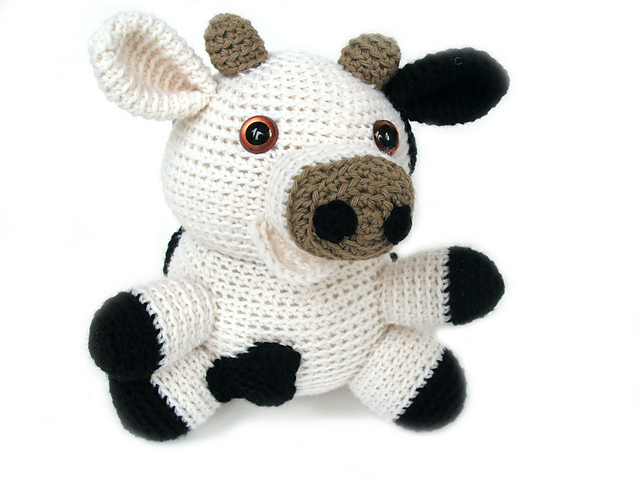 Get the Jackie the Cow pattern here. I love felting – just crochet with a wool yarn and throw it in the washing machine! (more detailed instructions are in the pattern, but basically that’s it!) The result is a very sturdy and durable fabric that will make a long-lasting stuffed animal. Give it a try! Get the bear pattern here. My Crocheted Closet: this book looks like it’s going to be amazing! It’s already an amazon best-seller! Really interesting article about how much the average woman spends on yarn. Are you over or under? I love Symposi Press, and these new (knitting) stickers are gorgeous! I’ll be teaching at Stitches Texas next weekend- will I see you there? I hope you have a great September!!! How to crochet the mane on a lion! Our Kepler the Lion CAL is well underway! Ami Club members have the pattern available in your downloads, and the pattern is also available for individual purchase! There’s already a lot of great finished Kepler’s in the July/August CAL: Kepler the Lion Finished Photos thread, but I know there’s still a lot of you who haven’t quite finished (or started!) yet! The trickiest part about this pattern is the mane. And although the pattern has step-by-step photos, I thought you might enjoy a little video that demonstrates the hardest part: planning and doing the first round of single crochets for the mane. For this technique, I begin by attaching with a single crochet (read more about how to do that, here!) Why? This is an easy way to join a new yarn, and because you’re doing a single crochet, you’ve actually started the work! No need to get confused by a slip stitch or extra knots. Don’t forget to share how your lion is coming along! It’s August! Hooray! It’s the time of year that I’m so happy it’s summer, but also won’t mind when it cools down a bit… how about you? There’s so much happening this month… umm… so much that we stressed out the server. Ooops. So, if you’ve been trying to get to the site over the past few days and noticed that it’s down, I apologize and hope you’ll try again! I’ve upgraded to a bigger server and hope it’ll result in a smoother experience for you! Isn’t she adorable?!? I’ve come up with a new technique for shaping her trunk that results in a curve without the pesky biasing that you get when you use slip stitches. I hope you love it! I do… so much I’ll be using the method again in September! The exclusive tutorial video is linked in the pattern! Not a member of Ami Club yet? Come on and join us! I know we all love 12mm craft eyes… they’re my fave, too! But other sizes are really awesome, and I’d like you to give them a try! That’s why, until August 17th, all Ami Club members get a free 5-pair package of 8mm craft eyes! No strings attached! Just add a package of 8mm black craft eyes to your cart, and then enter the coupon code that’s listed in the news & announcements thread in the forums. That’s it! I am SO excited about this quarter’s charity, Project Teddy Bear. Project Teddy Bear provides incarcerated men with an opportunity to learn how to crochet, and all of the handmade animals and hats that are made are then donated to the Upper Midwest Ronald McDonald House in partnership with the University of Minnesota Department of Pediatrics. We just connected this week, so I’ll be writing another blog post with more details. This will be our charity through the end of 2017! I’m sending out a sweet little button with every eyes order, while supplies last! Note that shipments that only include the free 8mm package of eyes aren’t eligible, but throw in another item and you’ll get a button! Orders over $20 will receive a Nelson enamel pin, while supplies last. I hope you have a lovely August! This post was originally published April 28, 2015… but it’s so popular that I’ve updated it and added a video! Crocheting is so much fun because there are so many options! Even a simple single crochet gives you the option of crocheting through the front loop, both loops or the back loop! Today, I’ll show you where to insert your hook for the most two popular techniques: the back and both loops. I’ll also link to some posts that you might find helpful… and included a video tutorial at the end! Every stitch is a V laying on its side. Do you see the V in the above photo? The back loop refers to the top leg of this V.
Crocheting through the back loop is my favorite! You’ll want to read this blog post that outlines all of the advantages! I know it can be hard to picture what these variations look like when you’re actually crocheting, so I’ve recorded a video for you! What’s it look like in the end? You’ll want to have a look at this blog post where I show you photos of how each technique looks, in the round and in rows! Little editorial note… I published this post about a week ago but I discovered that the fancy website widget that emails the blog post out to my over 5000 subscribers wasn’t working! Eep! And you can’t go without the July news! So, I’m republishing the post… apologies to the (few) folks who read it the first time! Usually, summer is a slow time in the crochet world, but not here at FreshStitches! Summer is the time when you might head out on vacation, find a bit of time by the pool or want to curl inside in the comfort of the air conditioning… with a crochet project in your hand! Am I right? The biggest news is that Ami Club members unanimously voted to turn the monthly newsletter into a public one for all FreshStitches blog readers! Hooray! Aren’t they the sweetest? So, I hope you enjoy! In this post, you’ll find out all kinds of news and I’ll share my favorite links that I’ve found this month! I’m always working to bring you the best selection of craft eyes, so I’m delighted to announce that I’ve expanded the shop to include 18mm color eyes! They’re available in the same, beautiful colors as the 12mm and 8mm color eyes (starting off with Pale Blue, Green and Brown: the 3 most popular colors). Although I don’t have an exclusivity arrangement with the factory, I haven’t seen these offered in any other shop! Many other pearlescent eyes are hand-painted, which means they are much more expensive. And all of my craft eyes have ridged posts, which allows for the plastic washer to click on tightly and securely. And Ami Club members get 10% off their entire eyes purchase: all the time! Just one of the many perks of the Club! I really love July’s exclusive pattern… Stanley the Stingray! Isn’t he a cutie? This pattern contains 3 brand new videos, including how to use stitch markers so you don’t need to count to do his shaping! This pattern goes away on August 1st, so make sure to login and download your copy! Update – the pattern is no longer exclusive to Ami Club members. Get the Stanley the Stingray pattern here. Our regular Crochet-a-long began today… and we’re making Kepler the Lion! All Ami Club members have Kepler available in their downloads, go grab him and start crocheting! The CAL ends on August 31st, and everyone who posts their finished photo to the FO thread is entered to win a prize! The prize this month is 2 skeins of yarn and a project bag… squee! Every month, Ami Club members receive 50% off featured patterns. This month, the featured patterns are: Frankie the Lobster, Jay the Bird and Murray the Squirrel. Check the forums for the 50% off discount code for July! Good on one or all three patterns! I just love the tail on Murray the Squirrel, but I know a lot of people find the loop stitch intimidating. You don’t have to! Pop over to this blog post for a step-by-step photo tutorial and a video for how to do it! The monthly ebook download for Ami Club members is about how to create different base shapes for your amigurumi. The stingray pattern for this month (and this robot!) were created using a square as the basic shape (instead of our usual circle). These combinations are so fun to experiment with! If playing with different shapes gets your juices flowing, then you’ll love my Amigurumi: Design Your Own Monster class on Craftsy! Lots of stuff is happening! It’s hard to keep up with it all! So, I’ve rounded up a few things that I thought you’d want to see. As a boring side note, if you live in Los Angeles County, you’ll notice that sales tax went up on July 1st. Doesn’t affect any customers outside the county! I met Joy at a conference recently, and she’s an absolute sweetie! And she offers amazing knitting courses (including some freebies). If you’ve been wanting to learn to knit, head to her site! Love this crane scissors necklace! And this measuring tape enamel pin. Actually, I’m obsessed with enamel pins. Check out my pinterest board full of Craft Enamel Pins. Speaking of enamel pins, who would be interested in new pins with my new Nelson logo? Which is your fave? Reply in the comments! Can’t wait to hear from you… and hope you have an amazing July! How to Start Amigurumi the Easy Way! The Sloppy Slip Knot. This blog post was originally published April 15, 2009. Today I’m going to show you my favorite way to begin crocheting amigurumi: using the sloppy slip knot. I find it easier to do than the magic ring, and it closes up nicely so that you don’t have a hole at the start of your work. I’ve included a photo tutorial and a video tutorial. Step one: To begin, don’t make a slip knot. Instead, simply twist the yarn once around your crochet hook. Step two: Chain two stitches. Step three: Single crochet 6 times in the second chain from hook. Not sure which one is the second chain? Check out where this arrow is pointing! It’s important to note that you go into the second chain away from the hook, not the second chain that you crocheted. The loop on the hook doesn’t count as a stitch. This is what your piece will look like when you have done your 6 single crochets. There’s a hole in the middle. Step four: Here’s the magic part. Just pull the tail, and your hole closes up! And don’t worry, the hole won’t slip open over time. If the hole doesn’t pull closed, this probably means that you crocheted your 6 stitches into the incorrect stitch. No worries, try again! And now you’re ready for the second round. You’ll want to read this post on crocheting the 2nd round of amigurumi for help counting your stitches. If you’re new to amigurumi, I think you’ll find my free ebook Amigurumi Guide for Beginners very helpful! 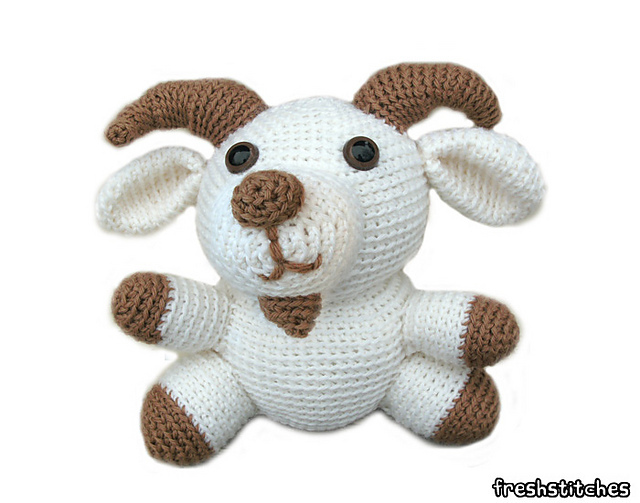 I have lots of great amigurumi videos on my video tutorial page, so have a look! Do you think it’s a technique you’ll try? 50% Patterns for Club Members! Did you know that every month, Ami Club Members get 50% off a selection of patterns? And that’s in addition to the exclusive free monthly pattern! If you’re not already a member, you’ll want to join to grab these awesome goodies! Want a real deal? Head on over to this post on Moogly for a coupon code for a 1 month trial AND to enter a craft eyes giveaway! Coupon expires June 9th. Meet June’s patterns, Carlos the Saguaro Cactus! Members who are subscribed to notifications will have already received an email reminder to go download this awesome pattern! New this month, video links are embedded directly in the pattern! If you’re a member who isn’t subscribed to notifications, you will receive a link reminder when your subscription renews. If you’re not a member yet, go ahead and sign up, and this pattern will be available for immediate download! Every month, Ami Club members receive 50% off of 3 selected FreshStitches patterns: the discount code is in the Announcements Forum. You can use the coupon for one, two or all 3 of the patterns! Members have already begun crocheting their cutie cactuses and sharing them in our CAL! Join us!